Yogurt is one of the foods that are listed in the first few safest foods for the babies. Yogurt serves as a source of extra protein, calcium and active cultures that assist in baby’s digestion process. It is quite a mild food which young children have no problem in digesting when consumed. But when can babies eat yogurt? Right before you introduce yogurt to your baby’s diet, be sure to have a sound knowledge of it and what else you should pay attention to. According to the former chairman of American Academy of Paediatrics and a renowned paediatrician, Frank Greer, yogurt may be introduced to the babies as early as 6 months of age. But in certain situations when the baby has been diagnosed with milk intolerance or milk allergy or she exhibits signs of any sort of allergy like eczema, it is better to wait a little until the baby is thoroughly checked by the doctor. In case baby has a distinct family history of asthma and food allergies, then introducing yogurt at the age of 6 months is probably not a safe thing to do. You can always have your baby checked up with your doctor for best results. How Can I Introduce Yogurt to Babies? Well, you know the answer to when can babies eat yogurt, but how to introduce? It is important to realize that babies cannot consume any type of form of yogurt. For best results, it is suggested to introduce extremely small amounts and see if the baby is able to digest the yogurt efficiently. Here are a few other recommendations. Initially serve plain yogurt to your baby but if your baby balk even at the simplest natural sour flavour of the yogurt then you can make it sweet by adding ½-1 tsp of sugar with an addition of vanilla extract (1-2 drops). A number of companies market yogurts that are especially targeted for babies as they do not contain harmful additives or artificial flavours. Nonetheless it doesn’t matter if you use homemade or store bought yogurt as long as it’s whole milk and natural. 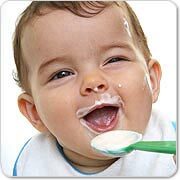 At initial stages, try giving a little amount of yogurt to your baby. You may give it with any food. Initially after feeding yogurt to your baby, look out for any possible signs referring to some sort of allergy. Wait around 3 days until initiating the feed of some other new food. Allergic reactions may be characterized by signs like: vomiting, diarrhoea, rash, cramping and swelling. In case your baby does develop allergic reaction against yogurt, you are recommended to consult the doctor immediately. It is found out that using honey as a sweetener in your baby’s yogurt is harmful for babies who are not older than 1 year. 1. Why Yogurt Can Be Served to Babies Ahead of Milk? The instead question that pops in our head is why babies can have yogurt before cow milk, which is supposed to be given after 12 months. The reason behind this is that the active culture present in the yogurt like bulgaricus and thermophilus assists in breaking down the lactose and thus aids its digestion. The yogurt making process results in milk protein modification, thereby easing up the digestion. 2. What Type of Yogurt Should I Introduce to Babies? According to spokeswoman for the American Dietetic Association and a registered dietician at St. Louis Children's Hospital in Missouri, Marilyn Tanner, the dairy products with full fat are required until the age 2 for proper development. Select whole milk yogurt that is pasteurized which may be naturally sweetened or plain. Try avoiding artificially sweetened and low fat products. For children who have type 1 diabetes, foods that are artificially sweetened are okay. 3. Is It Okay for Babies to Eat Shelf Stable Yogurt? Shelf stable baby yogurts do not require refrigeration which is quite convenient to carry around with you. These yogurts are cultured and then pasteurized. During the processing, the cultures are destroyed. Therefore, many of the elements that contribute to the benefits of yogurt are missing in the shelf stable yogurt.